Olympic champion Usain Bolt thundered to victory and a world championship gold medal in a mind-blowing 9.58 seconds, slashing 0.11 seconds off the mark he set at last year's Beijing Olympics. He left American Tyson Gay to settle for silver in 9.71 and fellow Jamaican Asafa Powell in third at the world athletics championships in Berlin. 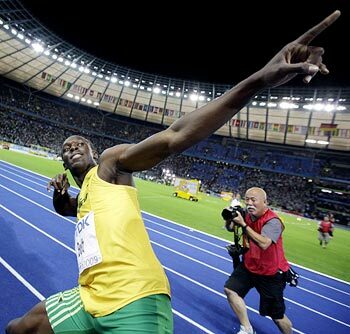 Not one to mince his words, newly crowned world champion Bolt said he could run the distance in 9.4 seconds. "I said 9.4. 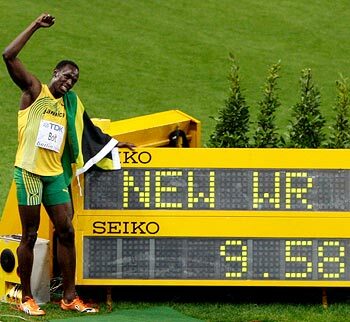 I think it will stop at 9.4 but you never know," Bolt told reporters. "We'll just keep racing," the 22-year-old said after his mesmerising run. "I don't run for world records. The aim was just to come and execute because it was going to be a tough race. I got a pretty good start. I was there at 20 metres and that was it," he said. The exploits of Jesse Owens in the same Olympic Stadium 73 years ago have been a hot topic of conversation in Berlin this week and Sunday's show could have a similar shelf-life. The 100 metres record is usually nibbled at in one or two hundredths of a second slices but Bolt took a huge bite out of it and has now dropped it from 9.74 to 9.58 in a little over a year. Bolt had given an indication of what was to come when he clocked 9.89 in his semi-final without seeming to hit top gear. That also came after he had false-started for the first time in his career. 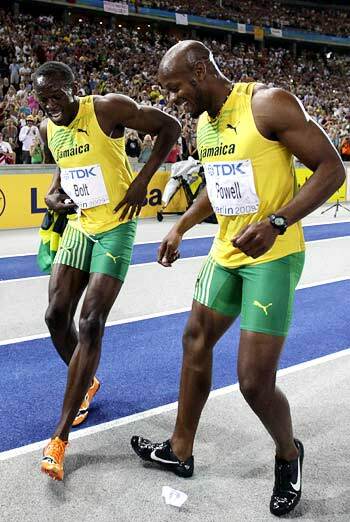 Compatriot Powell, who finished third, paid rich tributes to Bolt. "I'm just so excited about Usain's run, I'm stunned but it's great to be a part of this," he said. "I've been telling you someone could run 9.5. I'm happy he did it," said Tyson Gay, whose second-place time of 9.71 was barely noticed despite being the third-fastest ever. "It showed a human can take it to another level." Bolt unwound his long frame instantly from the blocks and was up and into his running alongside the fast-starting Gay to take control after 20 metres. He roared through the line, watching the clock all the while, before setting off on a lap of honour, talking to the media and posing for photos with fans for almost an hour. 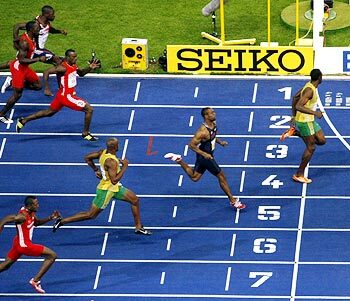 The Jamaican has also changed the template of how a sprinter should look. Lewis was liquid motion but the best of the rest of the last 40 years have been muscular, powerful athletes, usually well under six feet (1.83metres), who spent as much time in the gym as on the track. 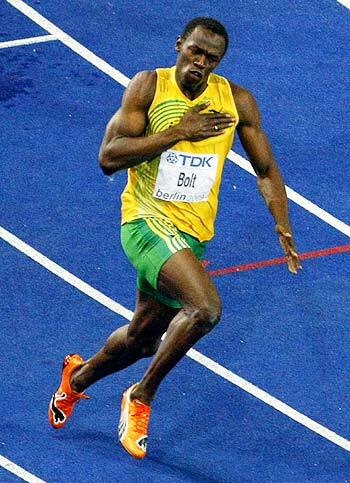 Bolt, at 6ft 5ins (1.95m) is loose limbed and lean and defies gravity the way he gets into his huge stride so quickly.